Ok, this is ridiculous! I have had this post written for over a week and I still haven’t posted. After a long, long delay, here it is….. It is always hard when a weekend comes to an end! Two days just never seems to be enough. I keep saying to myself that one day I will find a job that lets me work only four days so that I can always have a three-day weekend 🙂 I am convinced that weekends NEED to be three days. You always need a day to spend on cleaning and running errands. Then you need a day of play. And then you need a day to recover from play and rest before the week starts all over! The Mr. and I love weekends and man do we pack them full. Not many weekends go by where we don’t have an event (or two or three) on each day. Surprisingly, although we have had stuff scheduled, the last two weekends have been pretty chill for us. And in my opinion, it has been much needed! As usual, I have fallen behind in my posts. Work has been pretty busy as it is budget season so by the time I get home at night I just want a glass of wine, a quick dinner and to curl up on the couch with the Mr., little Leo and a fire and watch Parenthood. I am hooked on Parenthood. The Mr. has been bugging me to start watching so I could catch up with him and we could watch together. After pushing it off for a while, I gave in and now I am ADDICTED! Sorry, that was a side track…anyhow, let me tell you about two (well now three) weekends ago. Minus a little injury, which I will tell you about later, it was a pretty dang relaxing and fun weekend! The weekend started off with the Meek family coming over for dinner. Every couple of months, we try to get together for a meal and to catch-up. Our schedules are so hectic that it sometimes gets difficult to schedule but when it does happen, it is a blast. The last few times the Meeks have hosted as our house isn’t the most kid friendly yet, however, this time, I got the treat of hosting dinner. As I knew my work week was going to be pretty hectic, I needed to come up with a menu that wasn’t going to take a lot of prep after getting home from work. 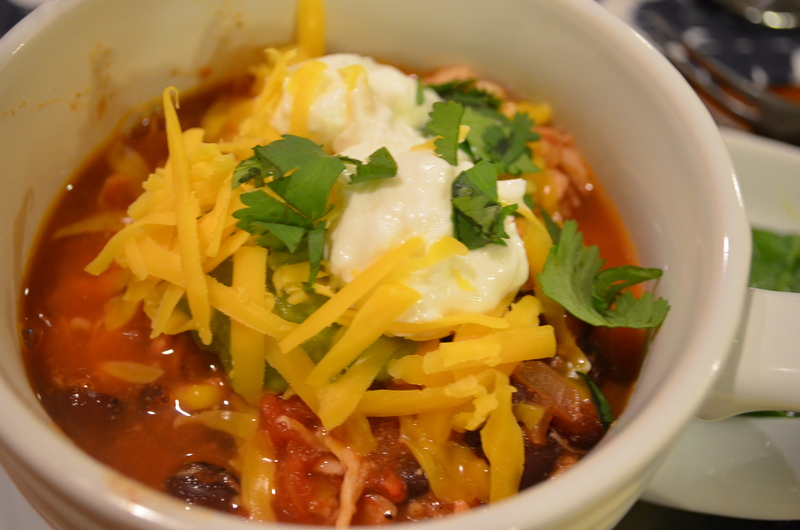 After scanning my Pinterest recipes I decided on Chicken Taco Chili that is made in the crock pot. To go with it, I served corn bread and a spinach salad with corn, beans, avocado, black olives and a honey orange dressing (wish I would have written it down as it turned out pretty good in my opinion). Overall I think the dinner turned out to be a success. 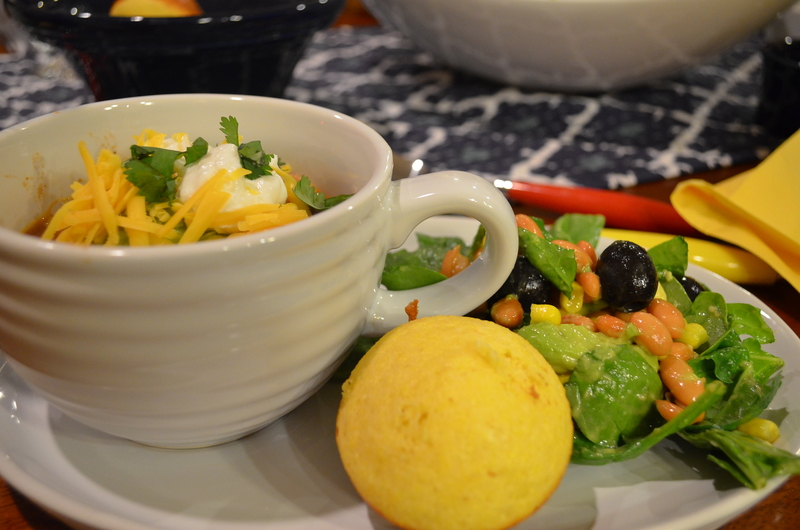 The little ones didn’t love the chili but both were good sports and ate some (and devoured the corn bread). Also, I had chips and salsa out before and pretty sure they filled up on that 😉 Thanks Meek Family for coming over and hanging out with us!!! Optional toppings: Cilantro, shredded cheese, sour cream/Greek yogurt, etc. Combine ingredients 1 through 14 in a slow cooker. Stir until combined. Place uncooked chicken on top and cover. Cook on low for 6 hours or on high for 4 hours, stirring occasionally. Thirty minutes before serving, pull chicken breasts apart with two forks. Stir and continue cooking. Top with fresh cilantro or any other desired toppings. On Saturday we laid low and did miscellaneous stuff around the house. Then at 5pm we went to a yoga class. We had a deal expiring that day so we had to go use it! After yoga we went over to Brie and Ryan’s house for dinner and to watch the huskies play. Man, was it a tough one to watch. I think we all lost interest after the first quarter! On Sunday we were signed up to run the Dawg Dash. This is a 10K that goes all over UW campus. Originally the East Side Piepers were supposed to run with us, however, one ended up being sent on a work trip and the other got sick 😦 Despite half our team being out, the hubby and I decided we would still run as it would be “good” for us. Thankfully the weather cooperated for us. It has been raining non-stop but held out during the run and didn’t rain at all. The only bad part…I ended up injuring myself! At mile 3, I noticed my knee started hurting. No idea why as I hadn’t twisted it or fallen, but by mile 5 I was in some SERIOUS pain. I ended up at just under 5.5 miles giving up and sending the hubby ahead to finish while I limped through campus to the finish line! The rest of the day I spent laying on the couch as I could hardly walk. Still no idea why it hurt…three days later I was almost back to normal. I think it probably has something to do with tight muscles but no clue. Oh well, thankfully I healed fast. That was the weekend (well two or three weekends ago), I have lost track! Hope everyone is well!